Make a Joyful Sound at this beautiful 6 bedroom Outer Banks vacation home in Corolla, on the Soundside. Private pool and hot tub, elevator. Rec Room with pool table, refrigerator and microwave. Theater room with big screen TV and Netflix streaming. The Queen bedroom on the mid level has a bathroom well designed for guests with mobility challenges, including a 36" doorway, rails for toilet, roll under sink and roll in shower with rails and fold out seat. There are 3 rollaways for guest use.Gas fireplace, multiple TVs and DVD player, stereo with CD. Enclosed outside shower, park grill and gas grill, beach chairs, sun decks, carport. Free parking area on Windance Lane for Villages at Ocean Hill guests. This lot holds 20 cars & provides direct beach access. Please note there is a fee for use of the Fitness Center. *If there is specific information you need to have regarding accessibility please let us know. We are happy to go out to any home and take photos and measurements for you. First Level: Entrance way with a 3 inch lip into the home, door width 36". Elevator goes to all floors. The top floor elevator entrance dimensions are 40 x 60. Pool access: Doorway width is through a 28 inch wide slider with a 4.5 inch lip. 28 inch wide gate to the pool and hot tub. Queen Master Bedroom has 36 inch doorway, rails for the toilet, roll under sink and roll in shower with rails and a fold out seat. There is also a hand held shower nozzle. Shower lip is 1 inch. Door from the bedroom to deck is 33 inches wide with a 4 inch lip. 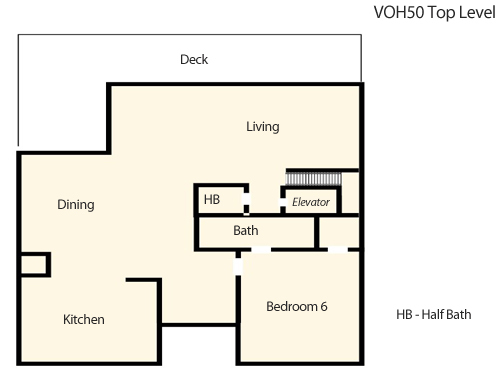 Top Level: Open and spacious living/dining/kitchen area. Elevator entrance is 40 x 60. Carpeting and large tiled kitchen. Kitchen is tiled. 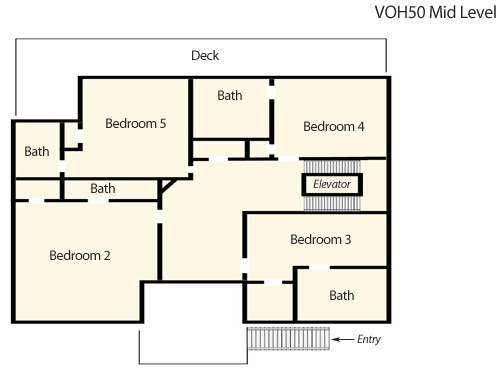 Upper level is easy to navigate, there is room in the great room for a wheelchair to navigate. Views from the great room. Doorway width is 27 inch and lip is 4 inches. This house was perfect, best house we have had in 10 years going to Outer Banks. We drive out on the 4x4 are for beaching, this is close to that. 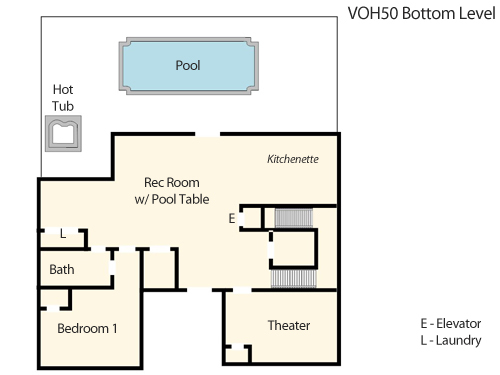 House is very spacious, media room was awesome and they had anything you would need in kitchen. I can't say enough about this house my family had such an amazing time. The home owners have thought of just about everything you need to make your stay easy. What a fantastic house! The pool was great, everything is in great shape, lots of space for everyone. We can tell a lot of time and energy has been put into this house. Even the exterior is well-maintained. This area is nice and quiet, tucked away in its own little piece of heaven. We guarantee we will be staying here in the future. OMG!!! What can I say about a Joyful Sound!! This home is amazing! Everything you can imagine and then some! We all enjoyed our week vacation in this home! It was truly more than we expected! We loved having the privacy this home gives you along with all the amenities to really make your stay worth it. From the pool, Jacuzzi, the elevator, the fully stocked kitchen, the space, the surround sound, the rec room and everything else, we were more than satisfied. My only suggestion would be to pressure wash the outside before the 1st family comes in after being vacant for a while. We would love to return soon and would love to stay at Joyful Sound!! !